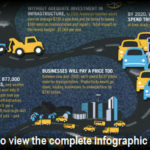 Presidents Roosevelt and Eisenhower envisioned a national highway system that would connect our nation and spur growth, prosperity and security. But even they could not have foreseen how significantly this system would transform our nation, or that our growth, prosperity and security would one day become dependent on how well the system functions. This week, we celebrate the anniversary of the launch in earnest of the national highway system, Eisenhower’s signing of the Federal Aid Highway Act of 1956 — and yes, we ought to celebrate what has been identified as one of the top 10 engineering achievements of the last century. But as we do so, we are also all painfully aware that after 55 years, demands have far outpaced capacity in many parts of the system, and much of the system suffers from poor conditions at the hands of years of underinvestment. Today, we spend 4.2 billion hours a year stuck in traffic, at a cost of $710 per motorist, and one in four of our bridges are functionally obsolete or structurally deficient. To move this country forward, we need to make the same kind of financial commitment President Eisenhower made for the interstate system. To meet the demands of our global economy, Congress must commit to a multi-year surface transportation authorization bill that enhances and improves connectivity and level of service across the nation. A surface transportation authorization must be founded on a new paradigm; instead of focusing on the movement of cars and trucks from place to place as we did in the Eisenhower Administration, it must be based on moving people, goods, and services across the economy. Beyond simply building new roads or transit systems, we must address our current needs to repair our existing infrastructure. The vision of Roosevelt and Eisenhower met and exceeded the demands of the 20th century. Today, we need a similar vision to meet and exceed the demands of the 21st century and beyond. Each one of us needs to help spread the message in our communities. How has your Section/Branch or business shared the message of the critical state of our infrastructure with your community? What more can be done on a local level?